The hope of Christ and faith is opened up in this insightful study that explores the small letters of John 1, 2, and 3. Ideal for sermon material and small group study, as well as personal study, this look over the letters of John is a reliable way of unlocking these three, small books. They offer well-researched insights into the letters, and are adept at helping you share these profound insights, either from the pulpit or the settee. John is known as 'the disciple whom Jesus loved'. He was under our Saviour's teaching and care for three years. He leaned against Christ's chest at the last supper and witnessed the crucifixion. Who better then to write about the love of Jesus than the one who had such first-hand experience of it? In these three letters, John is passing on the impact of these experiences to people he loves, tenderly encouraging them to see past their failings and focus on the promises available in Christ. John Hannah opens up the letters of John to show the simple message of freedom from guilt contained within. 1, 2, 3 John by John D Hannah was published by Christian Focus Publications in February 2017 and is our 56098th best seller. 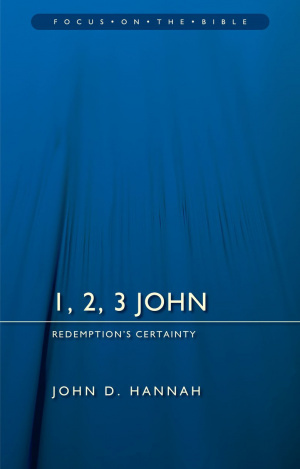 The ISBN for 1, 2, 3 John is 9781781917718. Be the first to review 1, 2, 3 John! Got a question? No problem! Just click here to ask us about 1, 2, 3 John.